Ronald Oranza celebrates at the top of the podium. 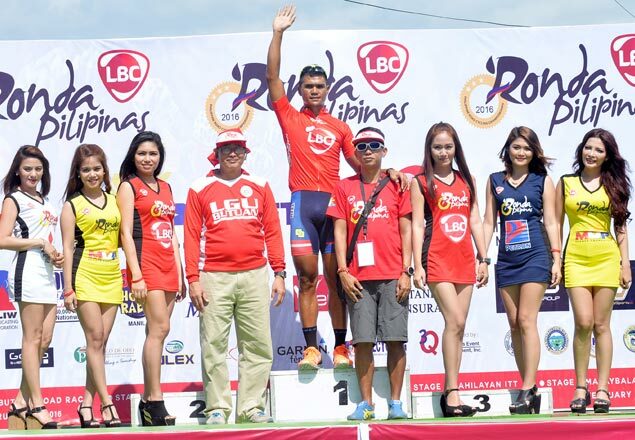 BUTUAN CITY - The opening race of LBC Ronda Pilipinas 2016 turned into a show of force for Philippine Navy-Standard Insurance as Jan Paul Morales seized the overall lead and Ronald Oranza the stage victory. Oranza ruled the 158.32-kilometer stage in four hours, four minuites and 15.01 seconds, besting teammates Jan Paul Morales and Daniel Ven Carino, who finished second and third with times of 4:04:15.19 and 4:04:15.32, respectively. The Navymen were so dominant they also took the fourth to eighth spots courtesy of team captain Lloyd Lucien Reynante (4:04:16.02), Joel Calderon (4:04:16.66), Jhon Mark Camingao (4:04:24.81), Rudy Roque (4:04:25.16) and El Joshua Carino (4:04:29.91). James Paolo Ferfas, who is representing Team LCC Lutayan, and unaffiliated Peter Gregorio prevented a sweep of the top 10 by checking in ninth and 10th with clockings of 4:17:49.82 and 4:20:38.32 in the sixth edition presented by LBC and LBC Express, sanctioned by PhilCycling and sponsored by the MVP Sports Foundation, Petron and Versa Radio-Tech 1 Corp. with Maynilad and NLEX as minor sponsors. Morales took the sprint lap while Reynate topped the King of the Mountain race in the stage, enough to catapult the two to the overall lead. Since this year's edition is employing a new scoring system that gives equivalent points to a certain finish, Morales amassed 20 points to take the leader's LBC red jersey while Reynante is a point behind with 19. Rounding up the top 10 in the overall standings were Carino (eight points), Calderon (six), Camingao (five), Carino (four), Ferfas (two) and Gregorio (one). Camingao, who was born in Davao but grew up in Taytay, Rizal, took the top best local award, which is given to cyclists who hail from Mindanao, ahead of Ferfas and Gregorio. Because of the Navy's impressive showing, it won a whopping P59,000 in this stage alone. "I was expecting it because we came prepared," said Reynante. Oranza came through with his third lap victory after six editions of this annual race, considered the biggest in the country today. "I'm just happy the whole team did well," said Oranza, whose best finish was third overall in the third staging three years ago. Expect another Navy juggernaut in today's 3.71-km Stage Two criterium, Reynante said. "Barring accidents or unforeseen factors, we're going to win it again," said Reynante. Ranlean Maglantay, the youngest participant at 18 years old representing Team LCC Lutayan from Marbel, South Cotabato, wound up in the top 20 while impressing everyone despite using a heavier and cheaper bike, worth somewhere around P20,000, compared to sponsor-issued bikes amounting to P250,000 from Navy cyclists. "I'm just happy to be given an opportunity to participate in the LBC Ronda Pilipinas. It was a dream come true," said the son of a motor mechanic.